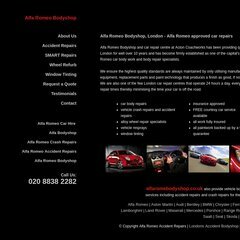 Topics: Accident Repairs, Smart Repairs, Wheel Refurb, Window Tinting, Enquiries, and Alfa Romeo Car Hire. It has 2 DNS records, ns1.quksdns7.net, and ns2.quksdns7.net. Its IP Number is 82.147.16.145. PING (82.147.16.145) 56(84) bytes of data.